Virtually new 2018 Pursuit DC 235 with less than 20 hours on her Yamaha 300 engine. She is generously optioned - most notably: factory installed Garmin Widescreen 12" display electronics package, Yamaha 300 with power steering, beautiful Titanium hull color, hardtop with enclosure, Lewmar windlass, and upgraded JL stereo system.The Pursuit does it all from serious fishing with it's lighted 15gallonlive well, 3 insulated coolers, and rod holders, to cruising in comfort with plush quality seating cushions, the clever fold-out chaise lounge and patented fold-down transom seating for two!Pursuit quality, versatility, and spacious accommodations make the Pursuit DC 235 a popular value leader in her class. Call soon and save on this extremely low hour boat.Buyer of this boat will receive a Yamaha Extended Service (Y.E.S.) contract through 1/6/2025!! 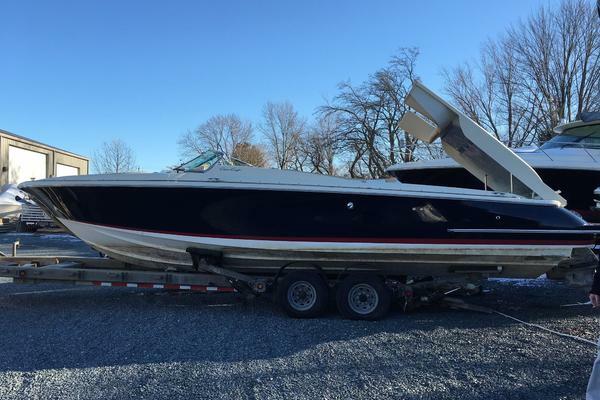 United Yacht Sales New Jersey would love to guide you through a personal showing of this 23' Pursuit 235 Dual Console 2018. This yacht for sale is located in Englewood, Florida and priced at $105,000. For a showing please contact us by filling out the form on this page and we will get back to you shortly! Versatile bow area seating area: 2 filler cushion for conversion tosunpad, or a tablesetupbetween the two side seats. Both seats lift on articulated hinges to expose large insulated self-draining coolers and/or storage areas. Easy walk-up access to concealed anchor Lewmar V700 windlass with remote control. Coming storage areas with12Voutlet. Windshield walk-through has solid door below for weather protection.Starboard Console: Forward of helm station contains large lighted storage area including dedicated storage fortable, front cushions, dock lines, and trash receptacle.Helm station: Tilt helm upgrade with 316L stainless steel wheel, 12V Panel with Illuminated Carling® Rocker Switches, Ritchie compass, Lenco trim tab switches with indicator lights, 12V outlet, fire extinguisher, cup holder/storage, Yamaha Command Link Plus display, and Garmin factory installed, flush mounted electronics package including VHF. Slide/swivel helm seat withfold downarm restsand folding bolster.Portside Head: Two piece fiberglass door with gasket, Integrated storage, grab rail and 316 stainless steel locking latch, molded fiberglass interior, manual freshwater Raritan porcelain head with13 gallonholding tank and 316L stainless steel pump-out fitting, sink with pullout, freshwater shower, integrally switched 12V overhead light.Cockpit: Companion seat with integrated storage/tacklebox below, cleverspace savingport aft-facing convertible chaise lounge, entertainment area: sink with pull-out sprayer, insulated cooler with fiberglass lid, raw water outlet in cockpit with quick connect fittings and 25' hose, LED cockpit accent lights (5), folding transom seat with patented adjusting backrest, ski/rod midship floor storage, Sunbrella bow tonneau cover, 12v DC MDP panel with battery switches,Entertainment area: sink with pull-out sprayer, insulated cooler with fiberglass lid.Notable Fishing Features: 4 SS rod holders in gunwales, lighted Oceana Blue 15 gallon recirculating insulated live well, Insulatedself drainingcoolers/storage under bow seats, in-floor rod storage.